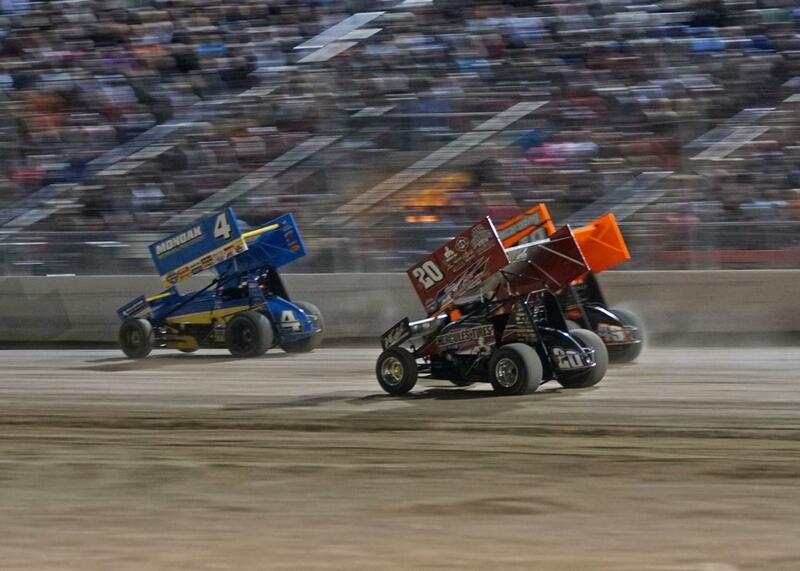 The LVMS Dirt Track is one of the hidden gems on the speedway's 1,000-acre property. The half-mile oval will host a trio of top-notch races in 2018 and has become a fan-favorite among dirt track racing enthusiasts. New track preparation techniques provided a lightning-fast, slick surface for the 2017 Duel in the Desert that had drivers salivating, and that should be the case again this year! Our world-class 1/2-mile groomed clay oval is banked at approximately 10 degrees. The infield measures 780'x375' and is available for excavation up to 6' deep. This facility includes two enclosed suites accessible by elevator and permanent restroom facilities. The adjacent paddock area is lighted and measures 500,000 square feet. Racers, save when you stay near the Speedway with Motel 6! 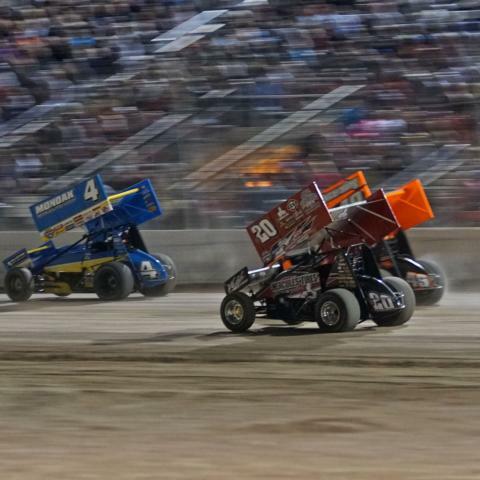 The Duel in the Desert is one of three major races scheduled for Las Vegas Motor Speedway's Dirt Track in 2019. Held each November, this year's event is the 22nd installment in Las Vegas. Tickets will be available on-site on race days and also can be purchased online or by calling 800-644-4444 four to six weeks before the event. 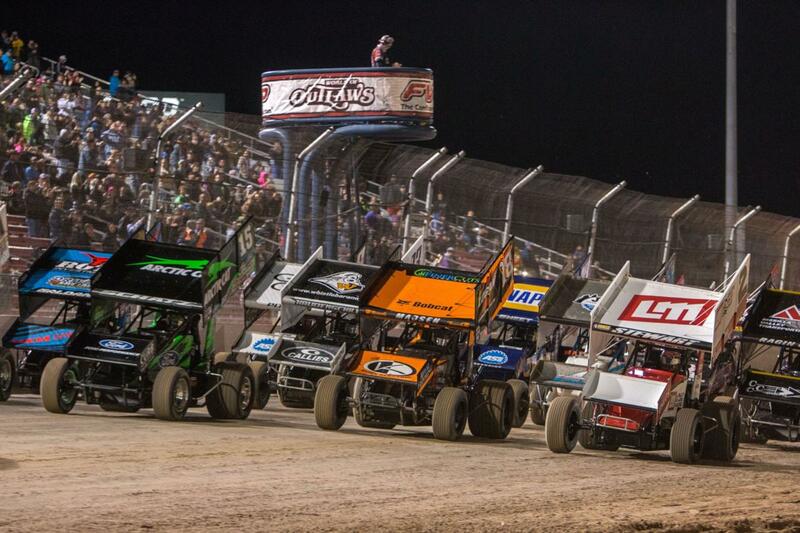 The Dirt Track at LVMS has been home to one of the nation's top World of Outlaws races since 1996. 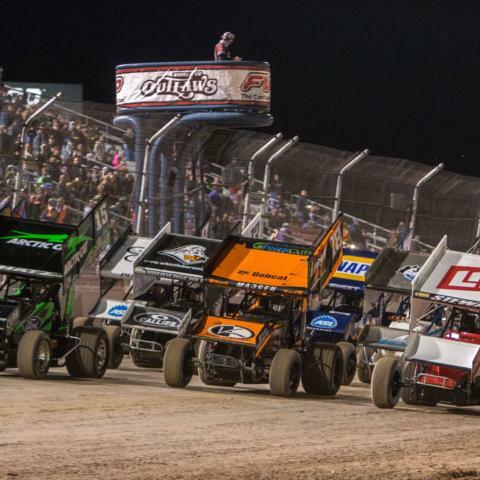 The World of Outlaws NOS Energy Drink Sprint Car Series FVP Platinum Battery Showdown presented by Star Nursery took place at the half-mile track Feb. 27-28, 2019, with the Star Nursery 100 NASCAR K&N Pro Series West event providing a co-feature on Feb. 28. The 'Greatest Show on Dirt' kicked off Las Vegas Motor Speedway's full week of racing in style, with Tim Shaffer and Donny Schatz winning Outlaws features and Hailie Deegan taking the checkered flag in the Star Nursery 100! The International Motor Contest Association (IMCA), organized in 1915, is the oldest active automobile racing sanctioning body in the United States. J. Alex Sloan, a native of Pittsburgh, Pa., was instrumental in establishing IMCA and ran more races than all other promoters in the United States combined, all under IMCA sanction. After Sloan's death in 1937, his son John continued the IMCA tradition. Under his leadership, IMCA continued to grow and held its first Late Model race on November 9, 1947 in Lubbock, TX. In the late 1970?s Keith Knaack introduced the IMCA Modified division. Few knew then that Keith's vision and innovation would result in the largest class of race cars in the country. In 1990, Kathy Root was named president of IMCA and in 1996 purchased IMCA from the Knaack family. Using the vision and innovation of Keith Knaack, IMCA is based on enforcing fair and consistent rules that promote affordability as the foundation of racing in America. Through the promotion of the "grass roots" weekly racer, IMCA has continued to see remarkable growth throughout the last decade. Modified cars are a hybrid of open wheel cars and stock cars - this class of car has the racing characteristics of a stock with the rear wheels covered by fenders and the front wheels open. There are sanctioning bodies that control the rules for this class at most tracks. Each Sanctioning body has their own set of guidelines provided in an annual rule book and their own registration fees. Stock cars are generally automobiles manufactured by the major automakers with certain modifications as allowed for each class. These are stock cars custom built for racing, usually with welded tubular frames and custom built or purchased bodies. Find more info at imca.com. During NASCAR Weekend, the dirt track hosts the annual World of Outlaws event. This is a 2-day evening event with a rotating feature car class on Wed. night, and the WoO on Thurs. night. Who are the World of Outlaws? The World of Outlaws are the premier sanctioning body for winged sprint car racing in the world, and are comprised of sprint car drivers from across the country and the world. The series was founded by the late Ted Johnson in 1978, giving winged sprint car racer's somewhere to compete with uniform rules and guaranteed purse money. What is a sprint car? Sprint cars are high-powered winged open-wheel race cars designed primarily for the purpose of running on short oval or circular dirt or paved tracks. They must weigh at least 1,375 pounds with the driver in the car. They have a high power-to-weight ratio, making speeds in excess of 140 miles per hour (230 km/h) possible on some tracks. 630 horsepower (470 kW) is commonplace for these machines and are fueled by methanol. The safety record of sprint car racing in recent years has been greatly improved by the use of roll cages to protect the drivers. Why is there a wing on top of the car? A large wing on top of the car with sideboards that face opposite directions help to produce a great amount of downforce to help keep the car planted on the track and turn in the corners. The wings also help to absorb energy in the case of the car getting airborne in an accident. Top wings became prominent in the early 1970's. Sprint cars also are equipped with nose wings. Why are the cars pushed to start? Sprint cars do not have starters in them, so a push truck is used to fire the engine, and get the car in-gear. A sprint car only has an in/out direct drive, no reverse gear. Find more info at worldofoutlaws.com. Can I get married at an LVMS event? Yes, please contact Sue Handel at (702) 632-8232. Can I bring a cooler to the race? No coolers are permitted in the grandstand seating area at LVMS. Fans are allowed to bring one non-alcoholic beverage weighing 20 ounces or less into the gates. Can I bring alcoholic beverages into to the Dirt Track? No alcoholic beverages may be brought into the grandstand seating area. How do I get drivers' autographs? Can I use my cell phone at the Dirt Track? You can use your cell phone, but keep in mind that access declines as the number of people attending an event increases. Do not rely on your cell phone if you need to relay or receive important information. Yes, contact a speedway security representative and they will direct you to the lost and found, which is located near the administration building. After an event all lost and found items are transferred to the reception desk in the LVMS administration building. Is there an ATM machine at the Dirt Track? Yes, there is an ATM machine located next to the Concession building beneath the grandstands. What handicap facilities are available? Las Vegas Motor Speedway seeks to provide reasonable accommodations for all qualified individuals with disabilities. Please contact the speedway ticket office at (800) 644-4444. What facilities are available if I have a medical problem? Mobile medical teams patrol the speedway grounds. If in need of medical assistance, contact a speedway representative and give them the location (i.e., seat number and section) of the person in need of medical attention. What happens if my child and I become separated in the crowd? Contact a LVMS security representative and supply them with a description of the child, i.e., name, age, color of hair, clothes they are wearing. Tickets can be picked up at the speedway's ticket office until the day of the event. Once the event has begun tickets can be picked up at the Dirt Track ticket office, located at the entrance to the track. What items are prohibited at the Dirt Track? Backpacks or any bag larger than 18" x 18" x 6"
One (1) non-alcoholic beverage per guest. Beverage may not exceed 20 ounces and must be contained in a plastic sports bottle or plastic cup. One (1) food item per guest. Examples include a sandwich, crackers, chips OR fruit. Family sized bags of food are not permitted.